Solenoid Inductance Calculator finds the self-inductance of a solenoid. Reading the text below you will find out how does a solenoid work in electric circuits and what is its inductance. The minus shows the resistive nature of the inductance; the potential difference is opposing the change in the current. The magnetic field inside of the solenoid causes this behavior. If we change the current, we are changing this magnetic field. In turn, it induces a potential difference in the solenoid. To learn more about the magnetic field inside the solenoid and the phenomena of inductance, check the Solenoid Magnetic Field Calculator and Faraday's Law Calculator. area of the cross-section A.
with the vacuum permeability µ₀ = 1.25664 * 10^-6 T*m/A. 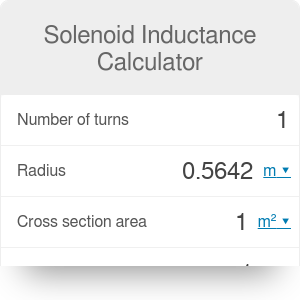 Using our Solenoid Inductance calculator you can easily find inductance of a solenoid for different configurations. Instead of specifying the area of the cross-section A, you can set the radius r. The calculator computes then the area assuming a circular cross-section. Solenoid Inductance Calculator can be embedded on your website to enrich the content you wrote and make it easier for your visitors to understand your message.